Merry Christmas! Today is the first holiday of Christmas, at least in Germany - where we already exchanged gifts last night - and I wish you all a wonderful time, hopefully with your loved ones. I thoght, since we are all very busy today, I would write you a post with lots of lovely pictures to look at - and not so much so read:). 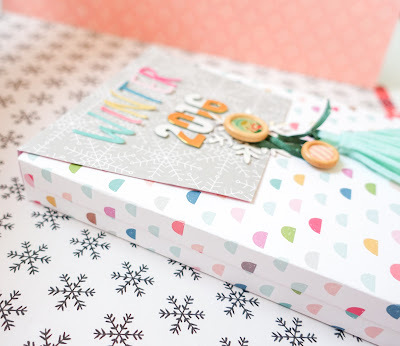 Therefore I will show you a winter minialbum in a box. For a long time I wanted to make a mini in a box. 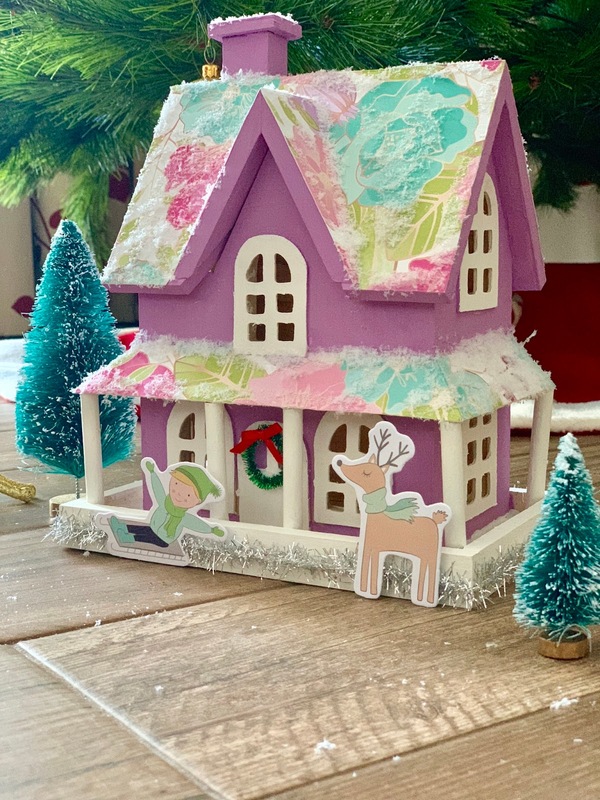 I thought that this looked kinda fun - and it is - and the kids love to look at all the cards in the box. This mini is a good thing to have a look at with 3 kids at the same time. Everyone has the best view because evryone can hold those cards and look thouroughly at them at peace. No discussing about going forewards or backawards in an album. I'm all for peace in our house these days. This is my stack of cards. They're all 4x6 inch, so you can use just one picture on them and be done. Or have fun and use lots of embellishments like I did. 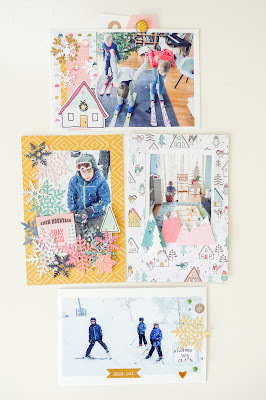 Some of the cards are double sided and some double cards are also pockets filled with tags for journaling. I used mostly Crate Paper's 'Snow and Cocoa' Collection. 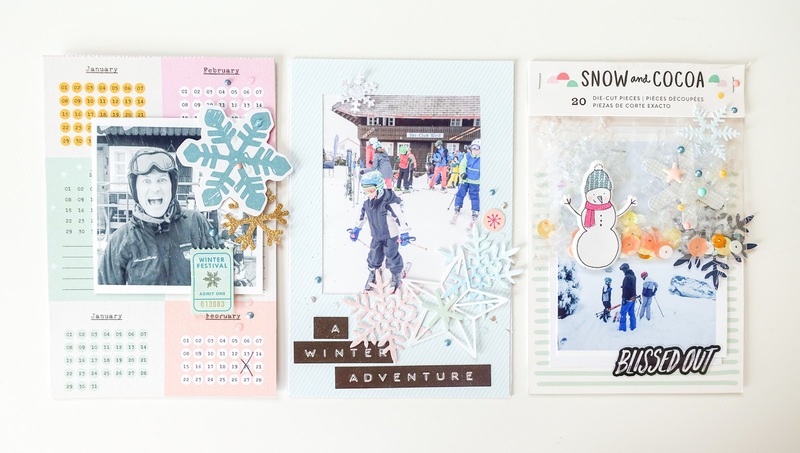 I love that collection and it is perfect for documenting our winter adventures. I even tried to use the packaging for a card. I like it how that turned out. Recently I bought some Nuvo drops and now I put them on everything. These little bottles are so versatile and I love the texture of them on my projects. Maybe a little to much at the moment because it is not an understatement when I say thet I put them on EVERYTHING. I'm totaly inspired by a minialbum by Steffi Ried for this project. She made a summer mini like this and I got the idea from her. I hope you liked the non christmas project today. I wish you all a happy winter and lots of fun - hopefully with snow. We already got our skiers and will be off to skiing the next days. Hi there, Alena is back again and I would like to share a recipe for fast cards. It's simple. Choose your favorite picture. I used a beautiful chipboard from Crate Paper collection "Merry Days". Add a fancy bow made of paper or ribbon. Also add a few green twigs of Christmas tree or mistletoe (like mine). To finish, I also added some beautiful lace. I think it turned out very elegantly. Hello again! It's Rebecca Luminarias with you for my last post as the December Guest. We are a week away from Christmas so my last post is, of course, gift wrapping again! 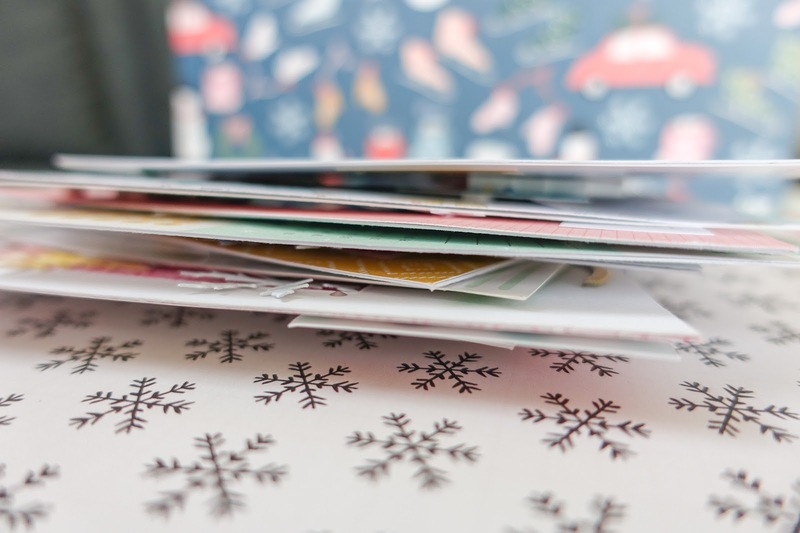 I've still got a lot of it to do myself, so being able to wrap up some gifts, as well as use those examples for this guest post is a bonus! 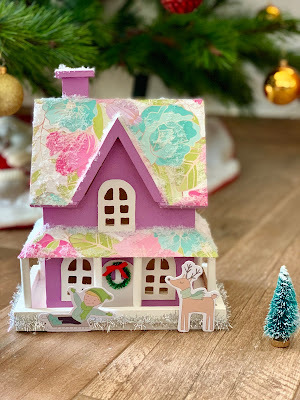 Today I'm using Cottage Christmas products by Fancy Pants Designs, and I've paired them with kraft gift boxes and some tags from Fancy Pants' The Yellow Door collection. I'm staying pretty traditional with this gift wrap, which is much different from my other projects I've done for In the Scrap this month. 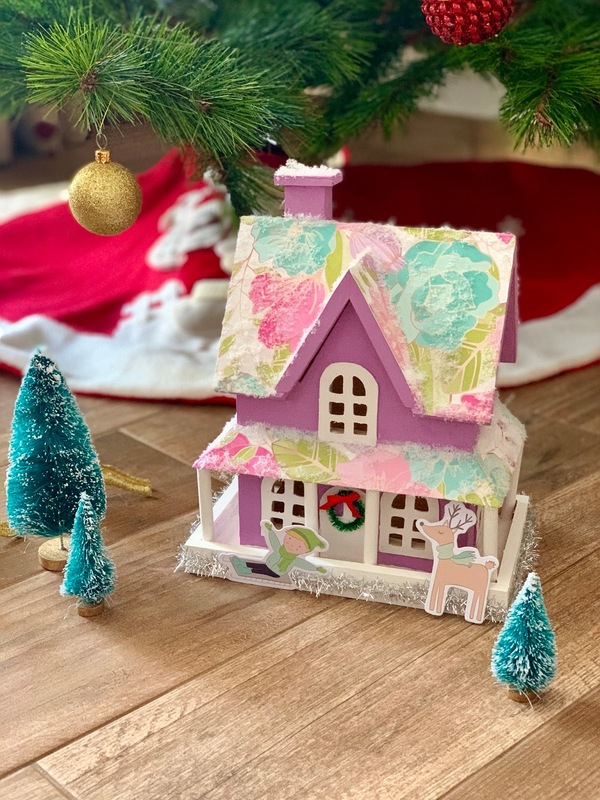 Do you stick to one color palette or theme each year or do you like to switch it up and try out a few different hues and motifs? I've definitely been bouncing around this year and haven't been able to choose just one! What I like most about these gifts is that I've basically just made a layered tag, then added two or three embellishments to finish the wrapping. I find it's sometimes less time-consuming to wrap if you don't actually have to use wrapping paper! black Yellow Door tag. Under the die cut are a couple of my own faux leafy stems. I've used a bit of lace and glitter tape to enhance the tag and draw attention to the "Merry" die cut sentiment, found in the Cottage Christmas pack. 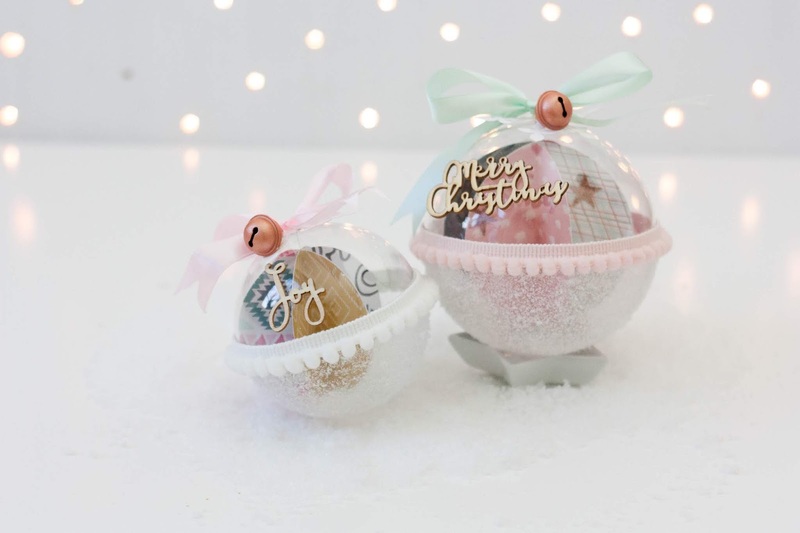 To go along with the tag, I wrapped a kraft box with lace and gold shimmer twine, then tied on a couple of small baubles with the tag. 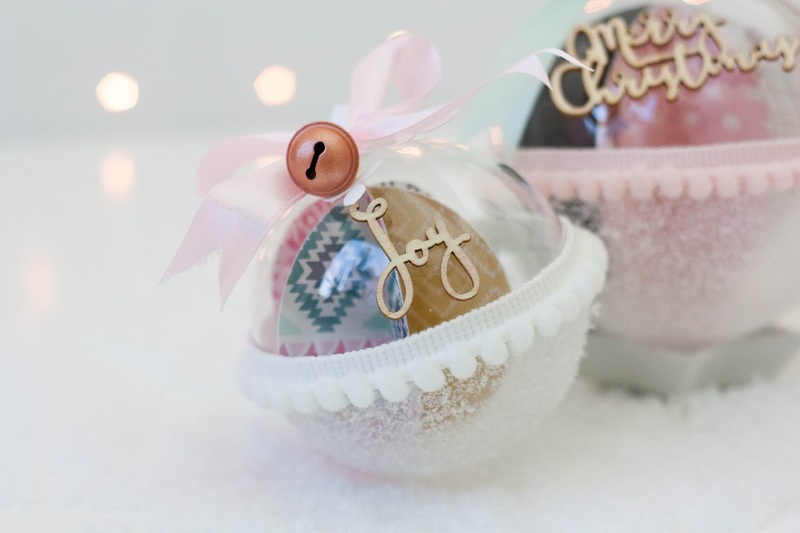 It's very traditional, and I've always loved the idea of including an ornament on my packages. The next box, a matching kraft box, features a black and cream striped tag as the base. I fashioned a small wreath out of faux leaf wired trim and adhered it to the tag over some pink tulle. 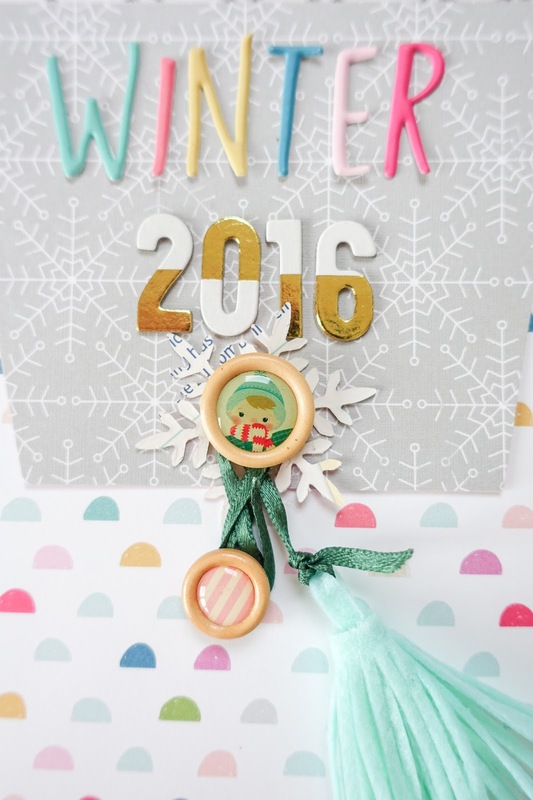 I love these pinecone die cuts and attached them to the tag with some 3D foam dots. I tucked some lighter green leaves in between the pinecones, and a little sticker from The Yellow Door that says, "give unconditionally." The final touch is a cute red paper bow. For the wrapping, I simply tied red ribbon around the box, stringing a length through the hole of the tag. I also placed a white doily under the tag, for curves and texture. in The Yellow Door collection that says "always handmade" at the bottom, and I thought it was a pretty good match for these gifts. I used a layer of pink tulle and adhered another pinecone and branch die cut over the top of it. I also added a small red chipboard heart to this tag. 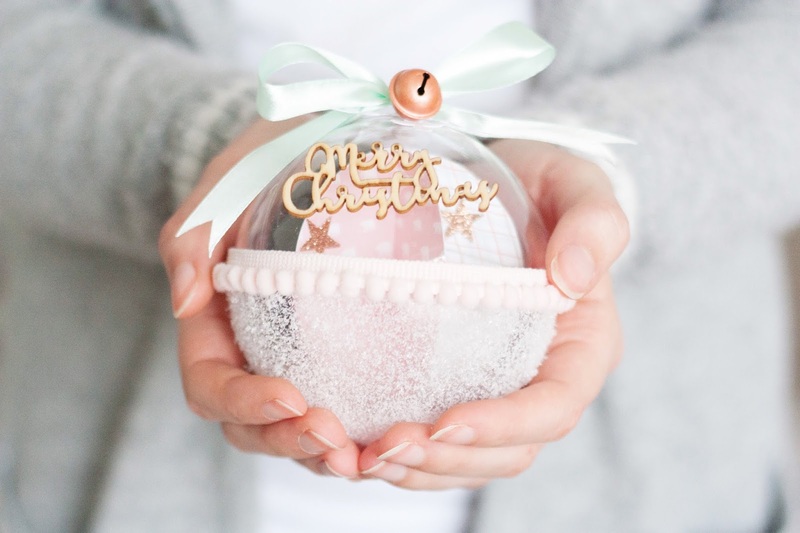 For the wrapping, I used red ribbon and lace, as well as a pink embroidery floss tassel and a silver bauble. It's simple and sweet, and this trio of gifts is now, thankfully, ready to give to a good friend. 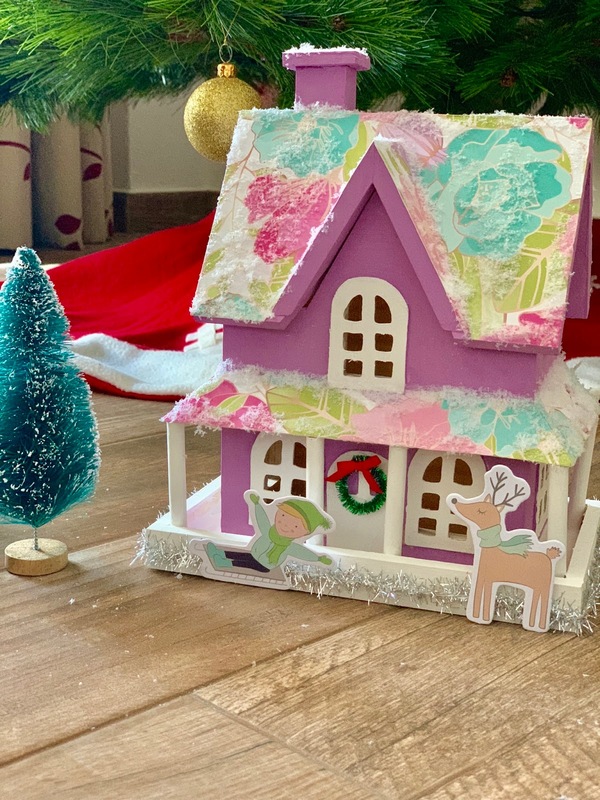 I hope you've enjoyed my projects this month, and I wish you the happiest of holidays! Thank you so much for spending your time with me--happy wrapping! Soy Mariona, y hoy vengo con un proyecto navideño sencillo y resultón, ideal para estas fiestas que se acercan. 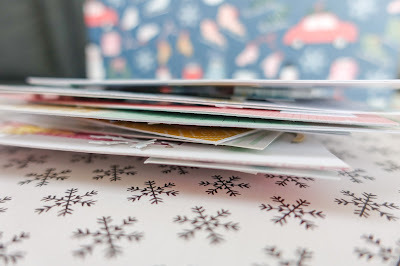 Se trata de unas cajitas perfectas para regalar a vuestros invitados, para acompañar un snailmail o incluso para hacer un calendario de adviento. Yo las he rellenado de chocolatinas pero las podéis rellenar con algun otro detalle pequeñito. Las cajitas las he recortado con la Silhouette a partir de un descargable gratuito de la página svgcuts.com . He modificado un poco el diseño original aumentando el tamaño y cambiando la forma de la ventana, ya que el diseño original tenia forma de huevo de pascua y yo lo preferia con forma circular. 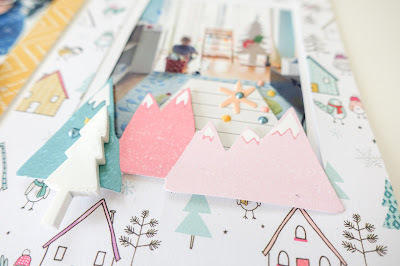 Para hacerlas he usado una colección navideña de hace un par de años que me gustó tanto que la compré repetida, es la colección Folk Christmas de DoCrafts. También he usado un poco de washi dorado y algunos adornos que he troquelado con la Bigshot y cartulina dorada. ¡Espero que os hayan gustado las cajitas y que os animéis a hacerlas! ¡¡¡Besos!!! Es una casita de madera con muy buen acabado, aunque tenía alguna que otra astillita, nada que una buena lija no pueda arreglar. Primero aplicamos gesso o algún tipo de tapa poros y seguimos con la pintura. Yo he utilizado blanca y morada de chalk paint de Amelie. Los tejados los he cubierto con papel decorado, uno de la colección Serendipity de Dear Lizzy. Para terminar he añadido con cola un poco de nieve artificial, una corona y unos die cuts. Espero que os guste. Besos, Belén. Hello! 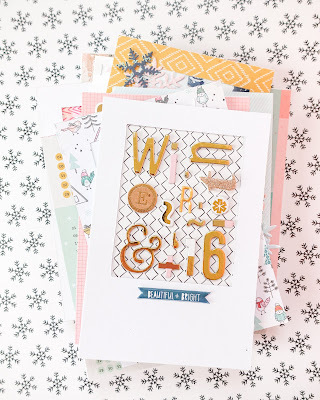 This is Rebecca Luminarias with you today and I'm so excited to be a guest this month on the In the Scrap blog! 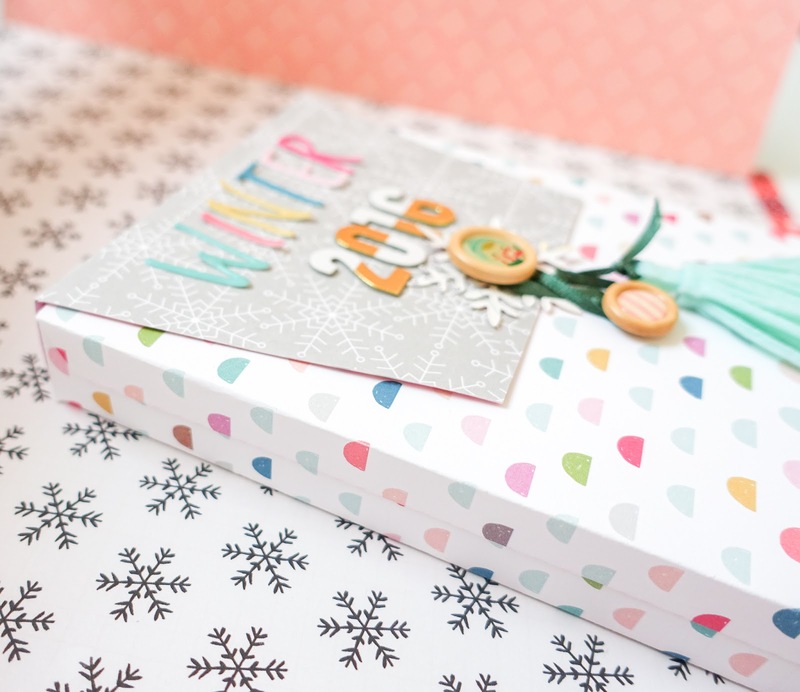 If you saw my take on the December Challenge, you might guess that I love wrapping gifts, which is 100% true! I LOVE to gift wrap and this time of year is the best time of year for it! I don't exactly have a gift wrap post today, but I did make a trio of tags, which I can add to some gifts in the future--it's always good to have a few of those on hand. I've used Crate Paper's Merry Days collection and I mixed it with some cut outs from Alexandra Renke's Nordic Animals holiday paper. Each cut out features one of her beautifully illustrated deer. I chose bright, warm colors for the backdrop to each tag. It's a great contrast to the subdued, minimal deer pieces. 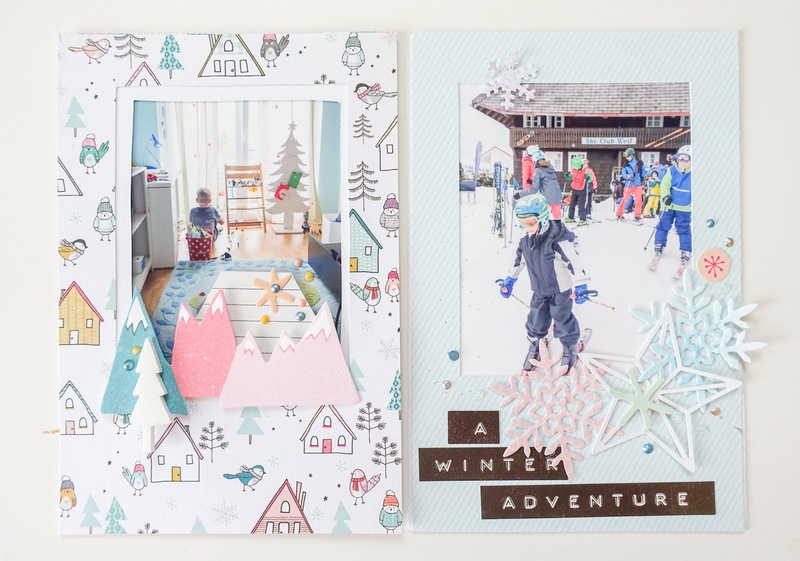 Then I just mixed and matched different embellishments from Merry Days, like cardstock and chipboard stickers, die cuts, and puffy gold foil stickers. I like to layer and add texture as much as I like to gift wrap, so you can always expect a few layers peeking out, as well bits of lace, doilies, and bows that I made from embroidery floss. 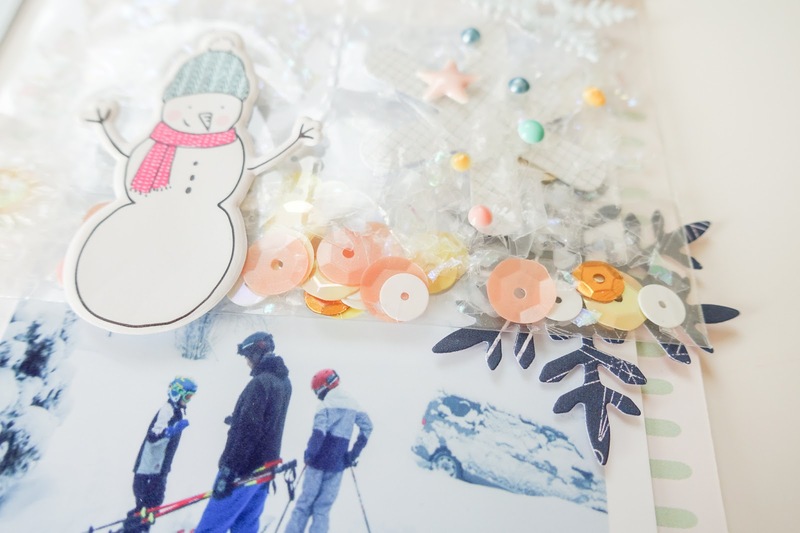 Layered tags make awesome gift wrap toppers! Each of these is 3" x 4" and you can see on this 4" x 4" gift wrapped box that the tag is all it needs (well, and a little lace and evergreen velvet ribbon!). I can't wait for the chance to use these! Thank you so much for spending a bit of your time here today. I'll be back again for one more post this month and I hope you'll come back for that. In the meantime, if you haven't done so already, do you think you might try creating your own version of some layered tags? I hope you will! Hello! 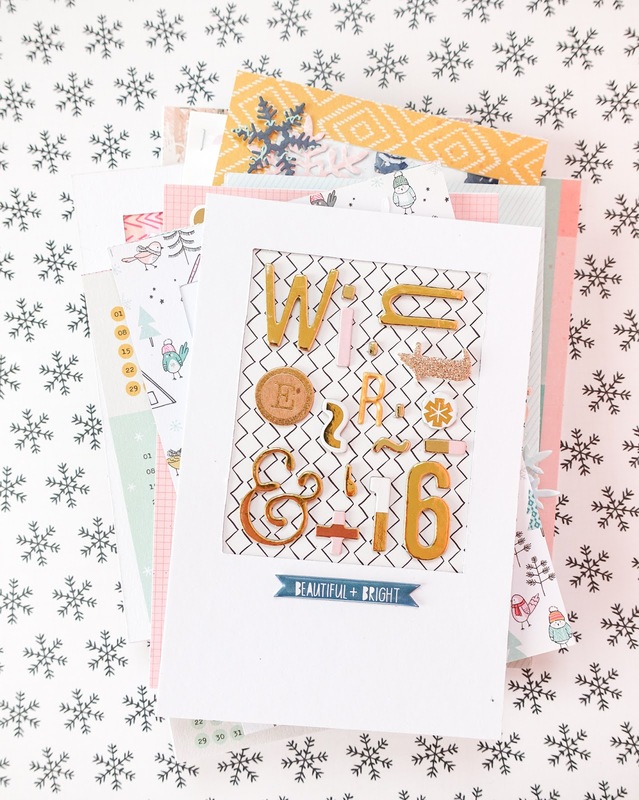 My name is Alena and I’m so glad and excited to be here as a guest designer in December. I am 36yrs old and a mom of 2 boys. I am married and we're from Russia. I started scrapbooking over 6 years ago when I wanted to make a Christmas card. Now I make layouts, mini albums and create a Project Life about my family. 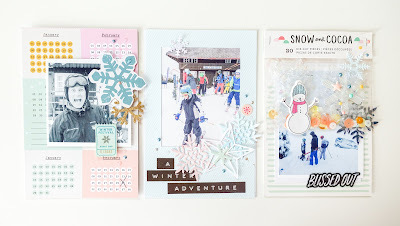 I have two winter layouts for you. I like to use white cardstock for the background. For the first layout, I cut out snowflakes using my Silhouette Cameo. To some snowflakes I added pink patterned paper as a base.Then they were sewn to the background. In the center of each snowflake I placed different type of button. After that I could stop and added some more embellishments. 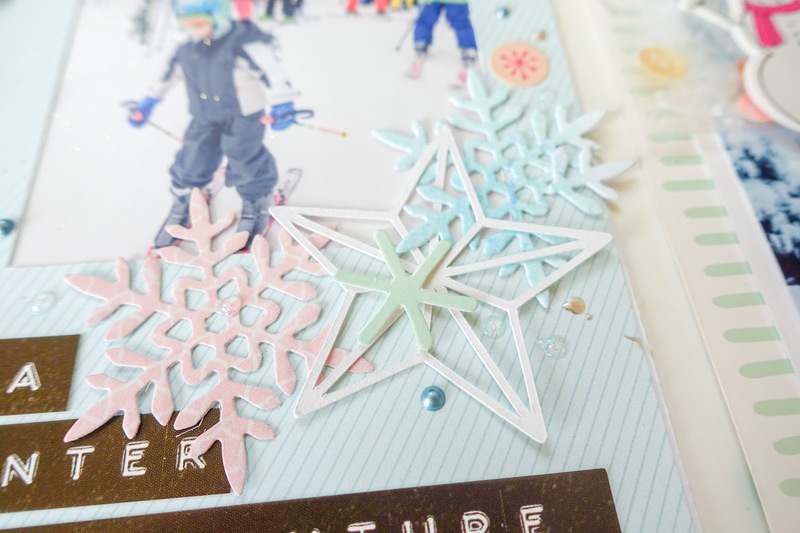 I chose appropriate stickers, puffy stickers and chipboard stickers and just placed them about snowflakes. The second layout is about my younger son. First I painted the white background with blue paint. Then I added horizontal and vertical lines using sewing. So my background became like a crossword puzzle. It remains to place the letters. In the empty squares I also added pieces of patterned paper and some stickers.